A arachnologist from the Senckenberg Research Institute in Frankfurt has discovered the first eyeless giant crab spider ever recorded, in a cave in Laos. The blind cave spider, dubbed Sinopoda scurion, was named after the Swiss company Scurion that makes headlamps for caving. Measuring in at only six centimetres (2.3 inches) long, it is not the largest of the 1100+ species in the huntsman family which are known for their speed and mode of hunting. 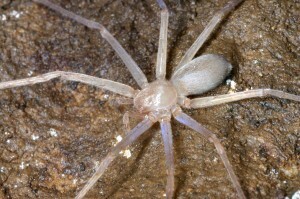 One of nine cave dwelling species described by the Frankfurt researchers, each of the spiders having adapted to their life underground in one way or another. The number of eyes range from eight, six, four and two or in the case of Sinopoda scurion, none. The study has been published by the scientific journal Zootaxa.